After Big Cottonwood Canyon marathon in Salt Lake City, Mark and I packed up and drove four and a half hours south from SLC to Zion National Park. We didn’t think that anything could compare to our time in eastern Utah at Arches and Canyonlands, but we were wrong! First stop en route to Zion was Kolob Canyon, a section of the national park that is northwest of the main site. We were still very sore from the marathon & half marathon, but were able to drive to an amazing overlook. We then headed to Zion, which is accessed via the quaint town of Springdale. Our B&B for the next few days was situated in the downtown area, and surrounded by the canyon. Shuttles buzzed back and forth from Zion entrance to downtown, making the location of our B&B very accessible to the park. We loved the Novel House Inn! Virgin river was wild post-monsoons! We spent the next couple of days exploring Zion’s impressive geology, molded by the elements over thousands of years. Our legs continued to feel the effects of the race, so we opted for more moderate to easy walks. Some memorable hikes include Emerald Pools Trail, Weeping Rock, and Riverside Walk, the gateway to the narrows. During our second evening in Zion, Mark attempted to hike the Canyon Overlook Trail (which is on top of a tremendous switchback road) while I rested my legs in the car. As he started to ascend the overlook, rain began to trickle down, but the trickles soon turned to monsoon rain. Luckily he was able to climb down without too much difficulty, but this gave me a real scare! We noticed right then that waterfalls appeared suddenly out of nowhere across the canyon walls. On our drive down the switch back, a boulder had fallen in to the road! We were able to drive around it but were reminded again how powerful nature is, and how Zion National Park is an active park continuously being formed by nature. 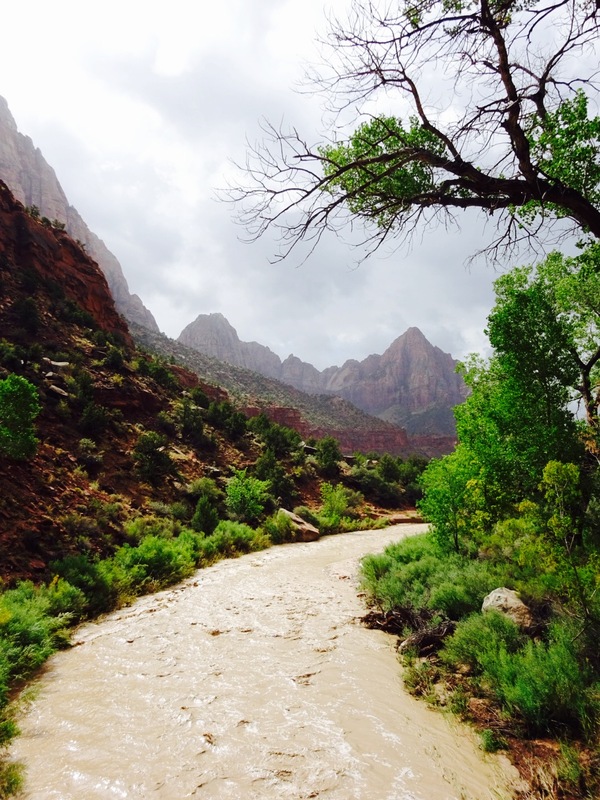 While in Zion, the surrounding area experienced some intense flash floods, an intense battle between water and rock. At the Zion visitor center, there was a hand written note at the wilderness desk indicating that flash flooding was “probable”. At the entrance to the narrows, there was another more permanent sign indicating the same thing. Regardless of how formal or up to date the warnings were, we did not make it far into the narrows/slot canyons, given our physical shape post-marathon. We were lucky, as the flash flooding in the area became a very serious issue. Another reminder of the power of nature. In between monsoon rains, I was able to take a photo of the rainbow (top of post). Our third day in Zion was met with some rain, so we stuck to the shuttles and visitor center, as well as the town of Springdale. We were sad to leave this incredible place but are looking forward to returning some day! 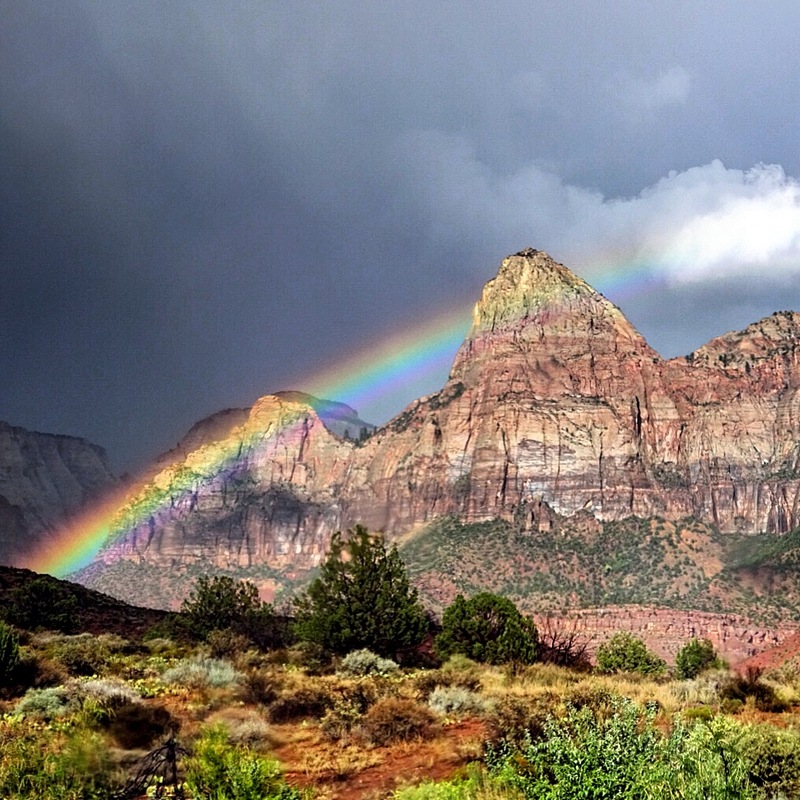 I am eager to visit Zion (and Utah!) again with fresh legs! Angels Landing here I come! Great pictures! You’d love Angel’s Landing too! Found your blog through fitfunmom! 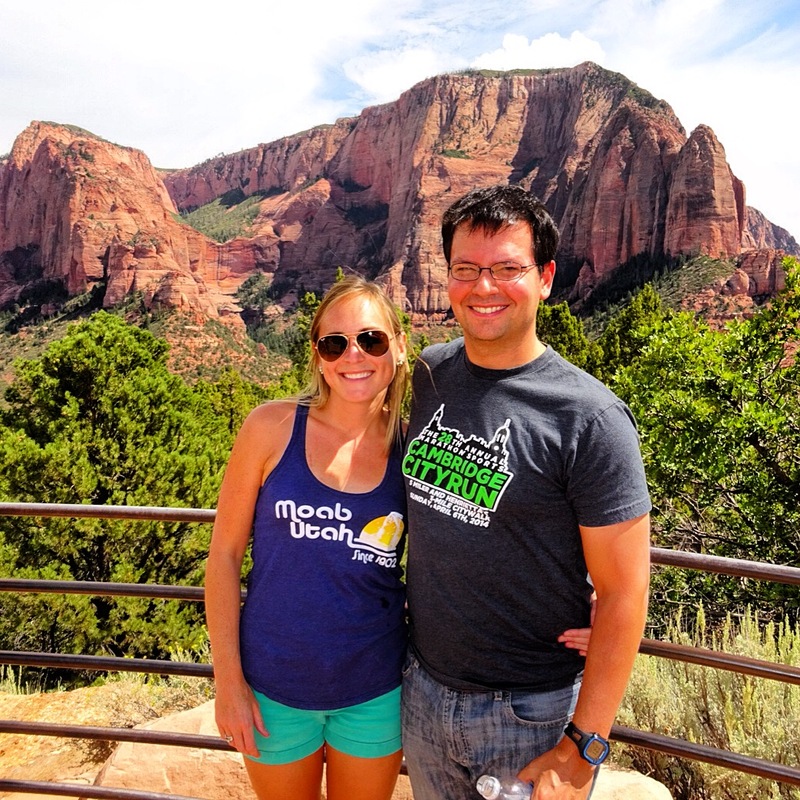 We hiked Angels Landing, and many of the places you’ve mentioned, this summer. So much fun! Wow, that’s incredible! Angel’s sounds amazing but scary too! I can’t wait to go back to Zion! Oh! Angels Landing!! I’m so sad you didn’t get to hike it! It is one of the most gorgeous views! Come back in the early spring, it’s best then (lots of green in the canyon, nothing is too hot yet).